One of the best ways to keep your hamster happy and healthy is making sure they have exercise ground and tools in their habitat. For that reason, hamster owners should have a medium of exercising for their pet rodents. It goes without saying that one of the most popular and effective media of exercising your hamster is a wheel. Hamster wheels not only entertains your hamster but also enable her to exercise. With the market crowded with many hamster wheels from different brands, we saw it wise to help you make an informed choice. We have spent close to 72 hours compiling this guide and analyzing over 40 hamster wheels. Finally, we settled on 6 of them, which we felt are the best in the market. We have outlined their features, pros, cons, and the reasons we recommend them. We will start with the buyer’s guide so as to better equip you with the right knowledge to help you choose a suitable wheel for your pet rodent. Why Do Hamsters Need a Hamster Wheel? How big should a perfect hamster wheel be? You have probably seen in many product logos a hamster running endlessly in a wheel. At first sight, this may seem compulsive and weird. But it is far from being compulsive; it is more of a natural instinct. If you look at wild hamsters and their wild behavior as well as needs, you will know why pet rodents like to run infinitely in a hamster wheel. Wild hamsters run for a couple of miles every night; in fact, about 5-6 miles. Running is a natural instinct that not only helps them escape their predators but also finds food. For hamsters, running is vital and essential as it keeps them happy and healthy. Studies have shown that a female hamster that runs for many miles each night gives birth to more pups per session than those that run a few miles or can’t run. In the domesticated environment, hamsters with wheels are less obese and healthier. They are also less bored- an essential thing for hamsters living in a cage. Some people term hamsters as crepuscular or nocturnal creatures. Nocturnal, to mean they are only active during the night or crepuscular means they are active before the sun sets and returns back to their hideouts and burrows when it gets dark. Well, the fact is that hamsters sleep during the day and are active in the evening or at night. Since your hamster lives in a cage, where they cannot run for miles, he needs something that will make them run in one place. This is where a hamster wheel comes in handy. For a hamster, it offers pure fun thanks to the endless runs it enables them to have. A hamster wheel helps these creatures maintain their optimal weight. Without enough exercise, your hamster could become overweight and obese leading to weight-related diseases. This puts a strain on their lungs, heart, and other body organs. This could even shorten their life expectancy. Also, your hamster can develop a condition called ‘cage paralyzes brought by lack of exercise. If your hamster becomes obese, this problem worsens. For hamsters, because of their active nature, inactivity leads to bone and muscle degeneration. This makes them lose their ability to use hind legs. If inactivity prolongs, they become completely paralyzed. If detected early, you can treat cage paralysis with a combination of vitamin supplements and daily exercises on a hamster wheel. However, you must consult a vet. A busy hamster is a happy hamster. As mentioned earlier, hamsters are very active when they are in the wild. Therefore, by providing them with stimulating hamster toys and a hamster wheel, you offer them a medium for exercises. Without any of these, you will find them engaging in self-destructive behaviors such as chewing their own skin or hair, breaking their teeth while trying to gnaw on cage bars, and many other behaviors. Also, if your hamster is alone in its cage, it may get restless and stressed. Therefore, a hamster wheel will keep them occupied. All hamsters love hamster wheels including those living in the wild; they enjoy it even though they have endless space in which they can run. These facts lead us to the question of how the best hamster wheel needs to be. In a quick way, it needs to be quiet. Your hamster is active at night, and you don’t want squeaking noise to wake you up. It should also be durable and stable. Most hamster wheels are made of plastic and metal. Both have their pros and cons. Metal hamster wheels are sturdier and thus will last longer. However, they can injure your hamster’s fragile legs as they are made with rungs instead of a solid piece. On the other hand, plastic hamster wheels are made of a solid piece, and thus are safe for your little hamster. However, they are not as durable as those made of metal. In our next section, we are going to discuss this in greater depth. You don’t need to read hundreds of hamster wheels reviews and check customers reviews on Amazon to know the value of having a wheel for your hamster in its cage. Even with limited room in a cage, a hamster wheel will enable your pet to run many miles every night, thereby relieving them boredom. The best hamster Syrian maybe overwhelming for dwarf hamsters. A hamster wheel meant for an adult Syrian hamster with 5-7 inches may overwhelm a dwarf hamster that is 2-3 inches in size. Larger hamster breeds need an 8-inch wheel while 6.5 inches spinning wheel will be ideal for small hamster species. You cannot expect a large hamster to use a small wheel; it cannot use the toy safely while bending or leaning in an improper posture. Keep in mind that the purpose of the spinning wheel is to help your hamster exercise their body including the spine, and a smaller wheel than their body will not allow them to exercise their wheel. Besides, keep in mind the weight of the pet as that might prevent the spinning mechanism of the wheel from working as it should. Running with an arched back will not help your pet achieve the benefits of having an overall healthy body. Therefore, it is best that you get the right-sized wheel for your hamster. Your pet should run in the wheel as though they are running in its natural environment. The best hamster wheel large should ensure the tail and toes of your little pal are kept safe from certain injuries. That’s why you have to ensure the surface is solid. Solid metal wheels withstand the gnawing and chewing from hamsters. Models that combine plastic and wood plates are also great; they create a modern and classic fusion. A human hamster wheel for sale made of metal offers more durability as compared to one made from plastic materials. However, most metal wheels have a ladder structure, which can cause injuries to the animal if the tail and feet fall between the gaps in the rungs. Be careful when selecting metal hamster wheels with a rung design as they could easily get the little legs and tail of your little pal caught painfully. This can lead to broken bones. Conversely, plastic hamster wheels have a solid design with no gaps, and thus your animal can run without fear of falling through. This makes them safe hamster wheels. Most hamster wheel spinning models come with attachment mechanisms to make them easier to fix them into the cage. This makes them stable and also helps cut down the amount of room these toys take up. Some also come with a two-way attachment as well as a stand to help you use it outside the cage. This will come in handy if you also want a hamster wheel for cats. One of the most common drawbacks of cheap 8-inch hamster wheel models or any other size of a hamster wheel is making a lot of noise when running. As we mentioned earlier, hamsters are either nocturnal or crepuscular creatures. This means they are active at night or an hour before the sunset. Probably, this is the time you want to sleep or relax. To relieve them of boredom when everyone is relaxing or asleep, installing a spinning wheel offers them a healthy means of entertainment. To ensure that the wheel runs quietly, ensure it runs on ball bearings, which are both durable and well-fitted to ensure smooth operations. If you confirm these two things are present, then this means the wheel will not make noise while spinning. If you buy a wheel and find it squeaky, then you can use mechanical lubricants. However, before buying, ensure to read customer reviews and check the product description to know the turning mechanism is intrinsically silent. The quieter, the better. Look for the best hamster wheel quiet that ensures you only get to hear the tiny paws of your hamster on the running surface and not the squeaky parts. Some hamster wheels feature a solid back wall. This is because most manufacturers think that this makes hamsters confident and comfortable about using the wheel. A couple of years back, hamster wheels had an open front to ensure easy access. However, the modern wheels are partially closed at the front. The idea behind this design is that this helps to cut down on injuries as hamsters cannot alight from the wheel when it is speeding. Support sideways across the wheel diameter are not safe as well because they can cause injuries in the event your hamster head get stuck in there. On top of all these design features, make sure your hamster wheel run quietly. We can classify the types of hamster wheels based on the material they are made of and support system. In terms of materials, hamster wheels can be made of plastic or metal. Metal wheels are known to last longer but have rung across their running surfaces which can cause sores and injuries. You can improve their safety by fitting thin cardboard or a strong paper on the rungs. Plastic wheels usually feature one solid surface thereby making them safer. Many have partly enclosed front wall. Regarding support system, there are stand-alone and cage-mounted units. They come in a variety of sizes, and it is essential to get one that is big enough for your hamster and quiet enough for your sanity at night. For people with younger pets, you should buy several exercise wheels of varying sizes to ensure that your hamster gets something to use at all stages of their growth. Conversely, you can purchase a relatively larger wheel that they will grow. Failure to get them a proper size wheel will lead to painful back injuries. To ensure your hamster has enough room to run safely and comfortably, ensure to check the size ranges when choosing a running wheel. Most hamsters will take time to adjust to the usage of a spinning wheel. However, some may take more time than others as they are overly frightened or cautious. If your hamster seems hesitant to use the wheel, don’t force him. Leave it in the cage, and it will learn to use it. You can entice them by placing a few treats in the wheel. If your hamster is still young, it is wise not to place a wheel in its cage as you are risking injuries. It is good to wait until he gets older and bigger. Also, if your hamster is about to give birth and you have an exercise wheel in the cage, it is wise to remove the wheel temporarily. This will help prevent the babies from getting trapped underneath the wheel or inside the wheel. Return the wheel once the babies are big enough to use the wheel. If your little pal has a tail, choose a spinning wheel that has a mesh construction or solid surface. Otherwise, his tail can get trapped when they swing while running which may lead to severe injuries. Mesh and solid wheels offer a more stable footing, and this will help prevent foot injuries. If your hamster wheel starts making noises, simply place a few drops of baby oil or vegetable oil on its axle. However, ensure to clean vegetable oil regularly since it can become rancid. Wax from crayons can also be used. Avoid using butter as your hamster will lick it before it can lubricate the surface. A silent wheel spinner offers your hamster all the benefits of a hamster wheel without noise. Never use mechanical lubricants as they can be toxic for your hamster. Regularly place oil on the wheel’s axle to minimize squeaking. The wheel boasts an axle-free construction that prevents tail or body entangling when running. This hamster wheel can be attached to the cage through the web mount. The size of the wheel is 9 inches across and features a 2.5-inch wide track. Need a sturdy wheel for your chinchilla? This one is made of wood interior and metal exterior to last long. The smooth surface ensures that your pet won’t be exposed to injuries. The wheel offers excellent results for weight management, and the company offers free shipping for the product. The Kaytee exercise ball for dwarf hamsters is excellent at keeping your hamster busy and entertained. Made of durable plastic, the ball offers ample openings and clear plastic. This helps to keep the interior ventilated and offer better interaction. Hamsters need to stay fit and happy while also safe from the accessories they use. This one from Ware Manufacturing is durable with a solid running surface that hamsters love. Besides, the design is colorful and toe-safe. Most pet owners expressed their satisfaction with the quiet hamster wheel. This is a well-built running wheel with a solid bottom and an enclosed design that picky rats, hamsters and gliders like. The tail shield makes it safe for your hamster, and the large room inside gives room for more exercise. The hamster wheel toy is reasonably priced for the value you get here. The wheel is made of sturdy ABS plastic which is durable and safe. Besides, it offers a quiet operation thanks to the dual sealed bearings. The product features a safe design, and the size is large to provide room for exercise. Cleaning it is extremely easy, thanks to the one-piece construction. The recommended minimum wheel size for a dwarf hamster is 6.5 inches while for larger hamsters, the ideal size is 8 inches, including Syrian hamsters. It is essential that you don’t purchase a wheel that is too small for your hamster as it may cause them to run with an arched back. If you see your hamster running with an arched back, then you should buy a larger wheel. The larger the wheel, the more comfortable your hamster will feel running in it as it will be similar to running on flat ground. Not all of them. However, cheaper wheels can sometimes be noisy. Keep in mind that hamsters are often active in the evening or at night. If your hamster wheel is noisy, then you will be disturbed by the noise when your hamster starts running at night. Although you can remove it if it gets too loud, this is not a good idea. 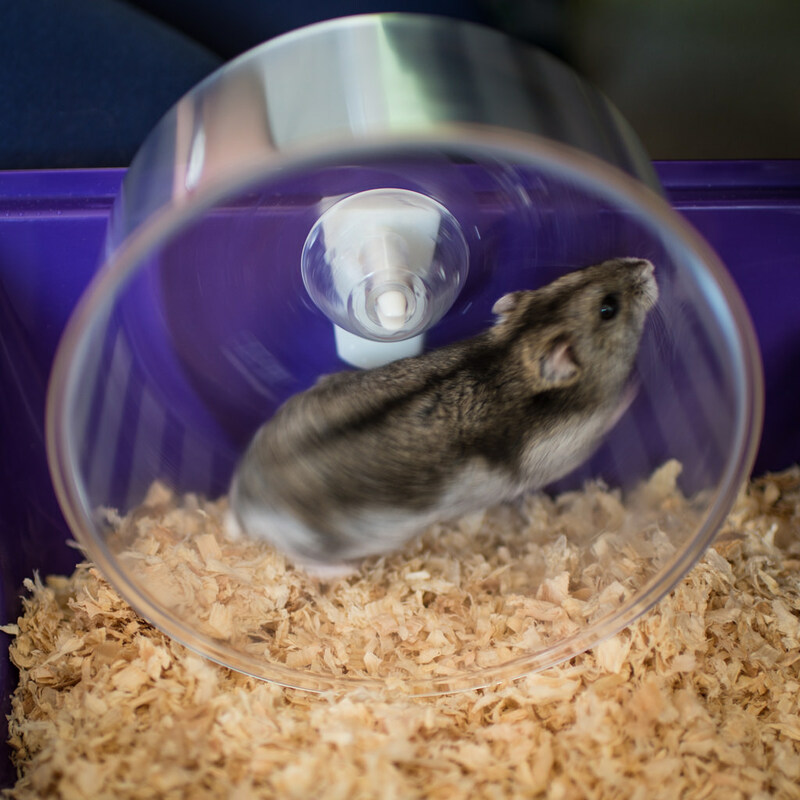 As we have explained in the benefits section earlier in this guide, a hamster wheel is an essential part of your pet’s mental and physical health. That’s why it is essential to go for a hamster wheel quiet; one that runs smoothly. Besides, try adding more olive oil in the wheel’s axle. This is to lubricate the joints of the wheel to reduce rattling and squeaking. Hamsters are little pets when compared to dogs and cats, and that’s why they are best kept in a cage. Although they can appear happy in a tabletop cage, you need to ensure that his exercise needs are met by providing them with the best hamster wheel. To ensure you buy the best hamster wheel, think about your pet’s size so that you buy one that suits them. Also, consider design features to make sure it runs quietly, and finally go for one with safety features. All the above hamster wheels we have reviewed are safe, durable, easy to clean, and sizeable for different hamsters. Choose one that is suitable for your hamster.